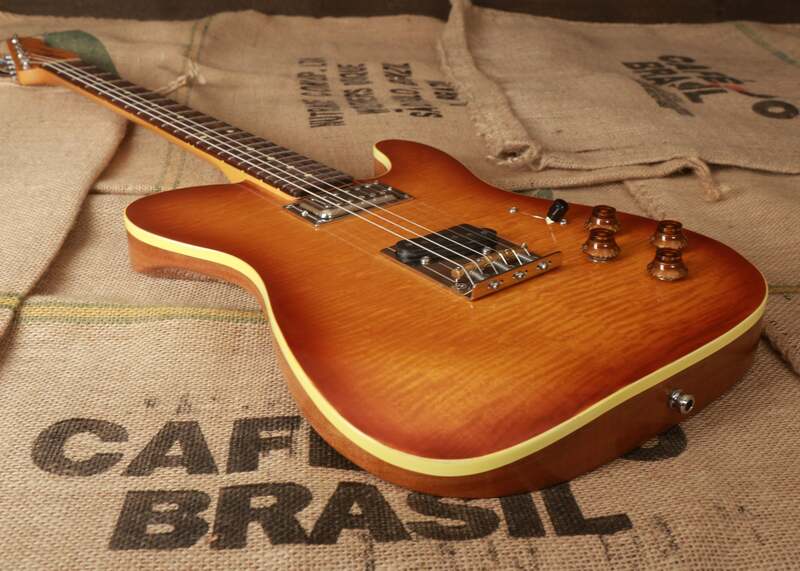 Introducing the new Coop Rescue – T line of guitars. 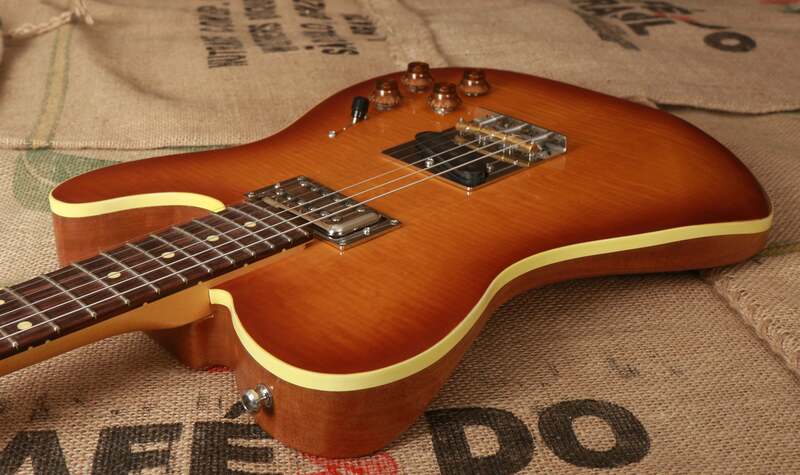 Rescue T’s are the first models we’ve built with the Rescued Wood we mentioned in another post. 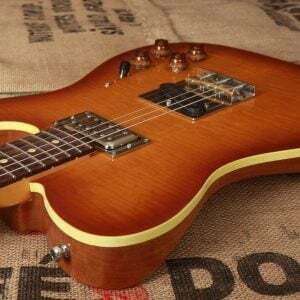 These Rescue T-style guitars are built in quantities of twelve with the gnarliest knotty-pine we can find in each load of lumber we process. The hardness of pine varies greatly across its surface so we take advantage of that fact and enhance the grain by abrading the soft part of the grain to reveal a deep relief that resembles 100 year old barn siding. 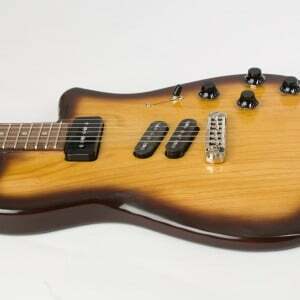 Although this line of guitars was developed with a specific group of woods, hardware and electronics in mind, the idea was that no two should look alike. 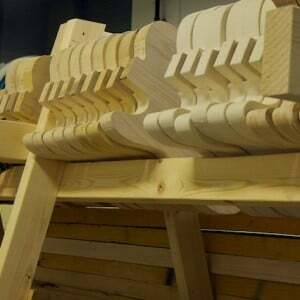 Obviously the grain of each piece of wood is different, but not even exact colors will be repeated. 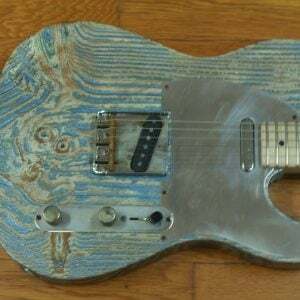 In the first batch of Rescue Ts we started with a large batch (enough to paint 12 guitars) of light blue metallic finish. 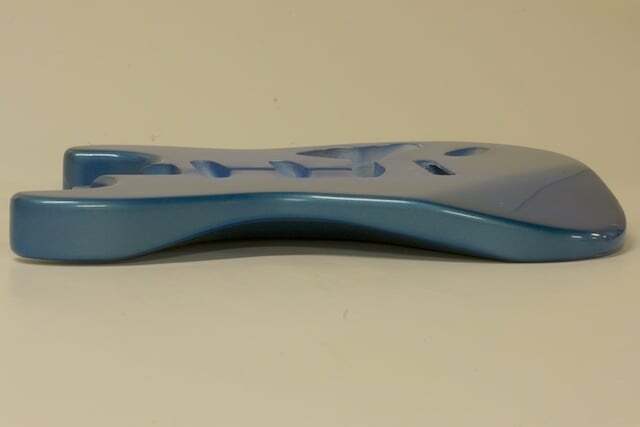 The first guitar in this series was painted with this initial light blue metallic paint. 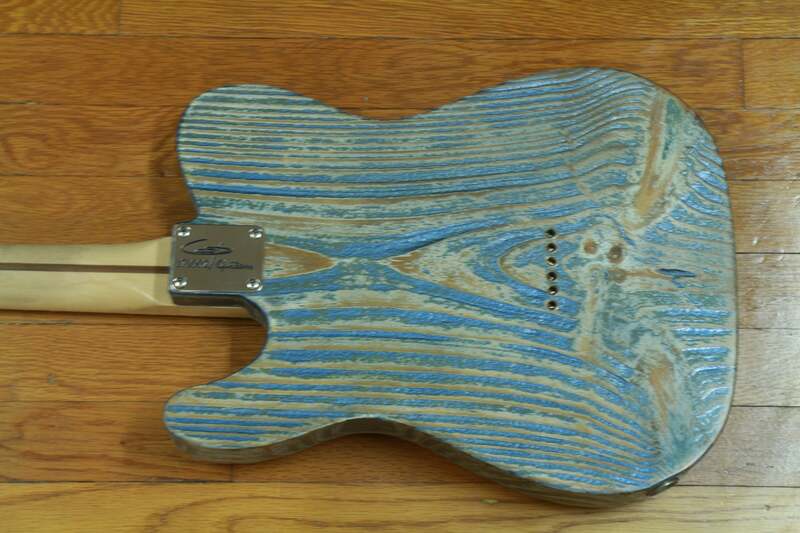 Before painting each consecutive guitar in the series, we modified the remaining paint to ensure a wide range of blues. 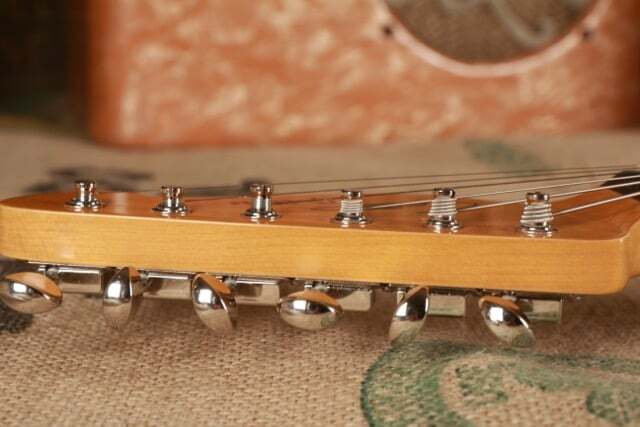 Don’t let the rustic look of these guitars fool you, they play incredibly smoothly and have a very wide sonic range. 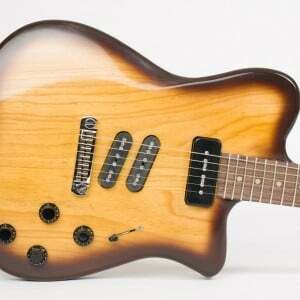 Comments from players who have had a chance to try these guitars have been very similar. 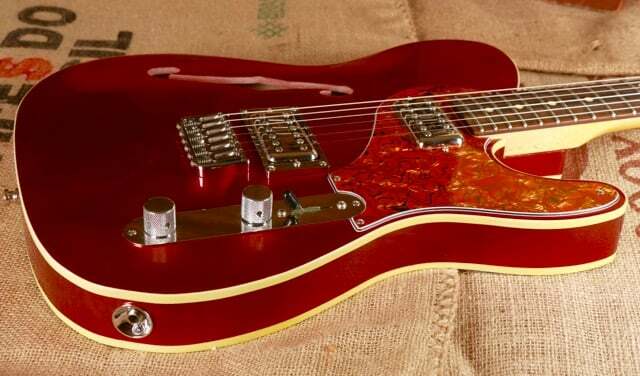 They’ve said things like “these feel totally modern in terms of playability but immediately comfortable and familiar as well”. Please enjoy some pics of the prototype Rescue T that started it all. 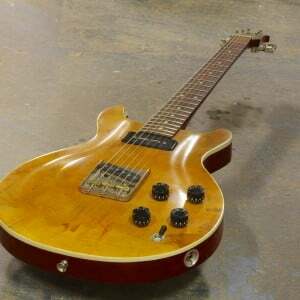 Rescued Wood– Wood that we source and process from logs to final dimensions for the use in guitar building. 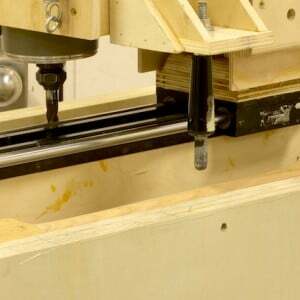 Logs that would otherwise end up in landfills are turned into something special! Our neighbors at the facility where we manufacture Coop Guitars, are Arborists and tree removers. Very often, our neighbors return from the job of the day with large logs on their trucks. Early on I asked what they do with these logs. The answer I received was surprising. Some of the more special logs are sold to mills to be processed into lumber, but most of the logs are dumped. Most of the logs that our neighbors secure, are from residential neighborhoods. 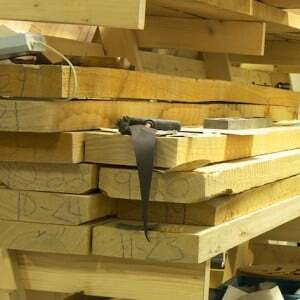 As a result, these logs often have nails and other metal objects that can damage a sawmill’s equipment. 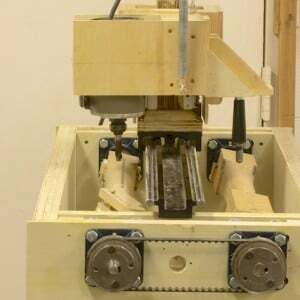 Mills seldom buy the residential logs because saw mills cannot afford the risk of metal objects damaging their equipment. About a year ago, I started checking out these logs that were coming into the facility. I was also introduced to a gentleman that has a really nice saw that he uses to turn logs into lumber for his personal use. 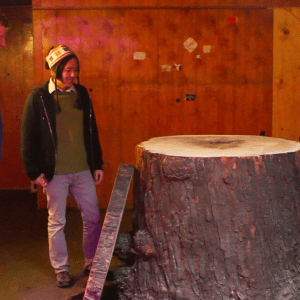 A plan was hatched to rescue as many of the logs as possible. We’d saw the logs into boards, air dry them for 6 months and then transport the boards to a commercial kiln for further drying. 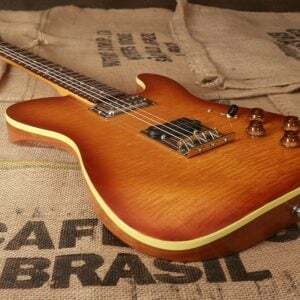 The sawyer has a steady supply of logs and I can also select a fair amount of boards that I can use to build special Coop Guitars and bodies for do it yourselfers. 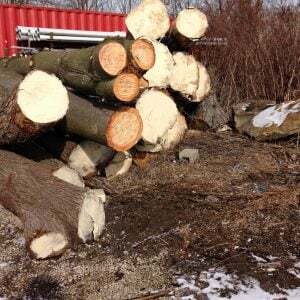 Truth be told, the cost of rescuing some of this wood exceeds the cost of purchasing the same type of wood from a lumber yard, but I feel good about the fact that so much wood is being kept from landfills. 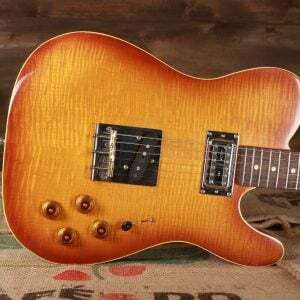 The guitars that we call Rescue-Ts are produced from this rescued wood. 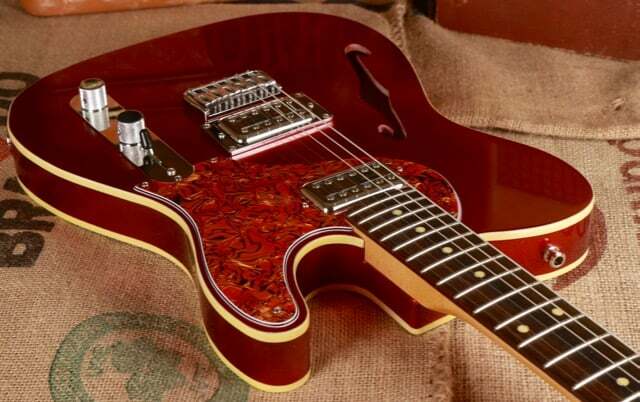 We are proud of these guitars as they are unique in appearance as well as having uniquely sourced materials for their construction. We were introduced to Nick Jaffe back in 2011. 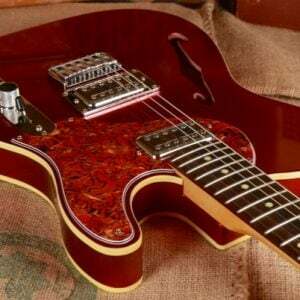 Nick creates awesome you-tube demos under the name JustNickMusic. Nick’s videos range from product demos (musical instrument related) to lessons, to musical collaborations, to interesting subjects of history. 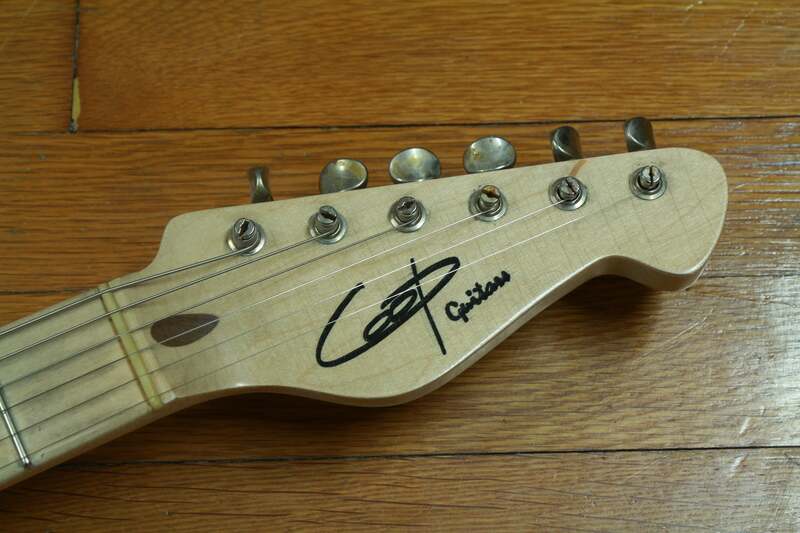 For most of his product demos, Nick uses one of two custom Coop guitars that he special ordered (his favorite being one he calls “Nickaster”). 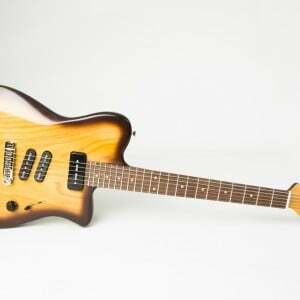 We receive lots of inquiries about Nick’s guitar, so we decided to make a production version of Nick’s guitar with a few tweaks. 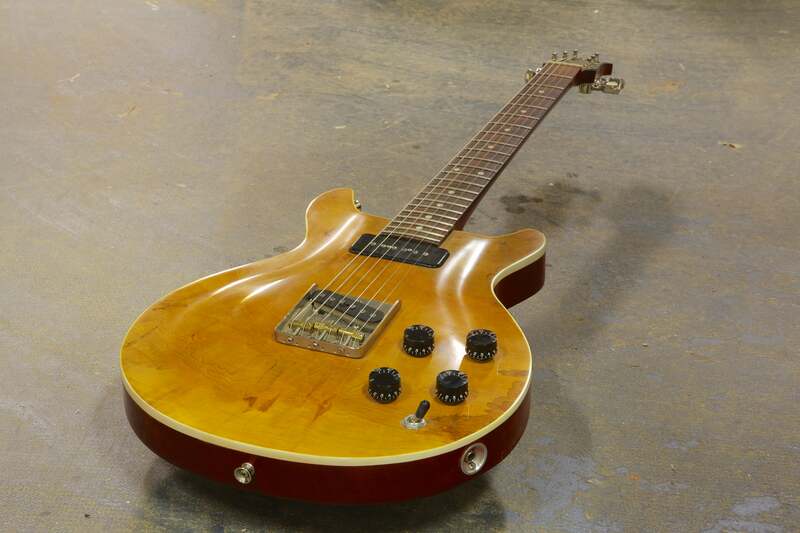 Pictured here is a customer’s guitar based on Nick’s, that Nick graciously demoed. 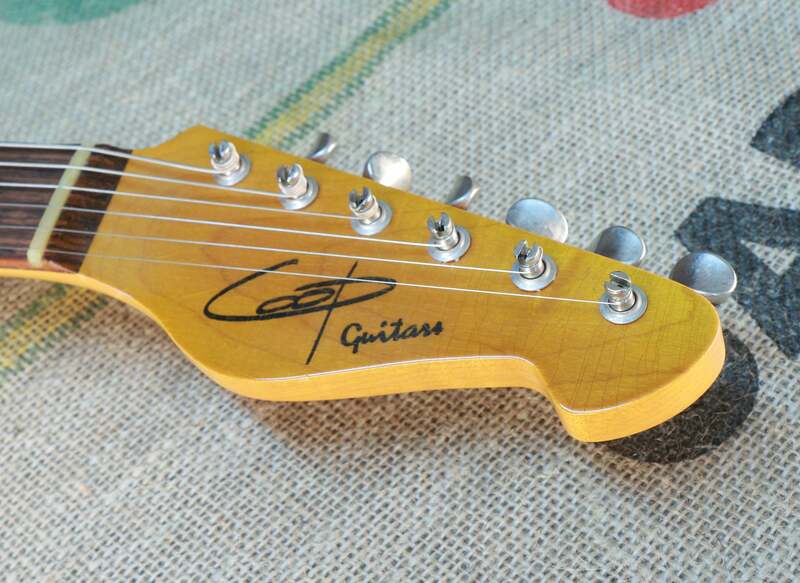 This guitar was commissioned by a gentlemen (Dave C.) who was intrigued by Nick’s channel. Dave mentioned how much he liked Nick’s demo method. In particular what Dave likes about Nick’s method is that Nick has an uncanny ability to present and verbalize the essence of a product so that if a consumer happens to purchase a product that Nick demoed, the consumer already knows what to expect of the product. 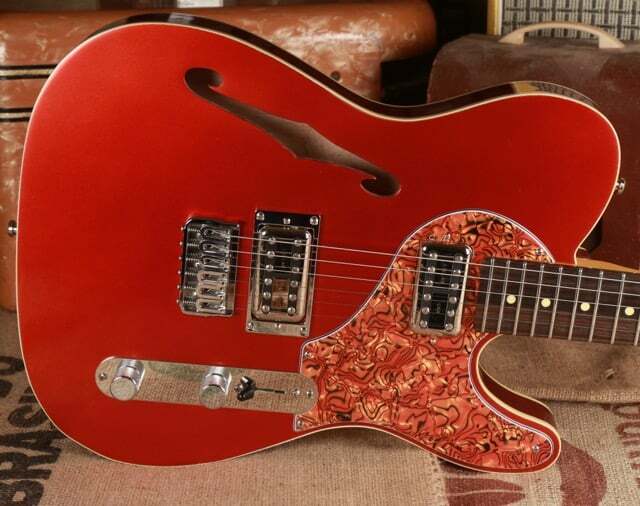 We went a little crazy with the pickguard materials on this guitar but we had fun! 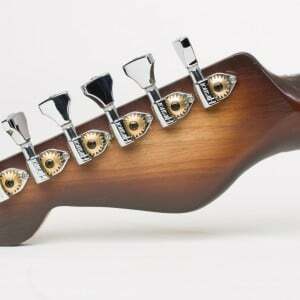 We actually supplied 5 different guards with the guitar so that Dave can swap them out when he feels like it. 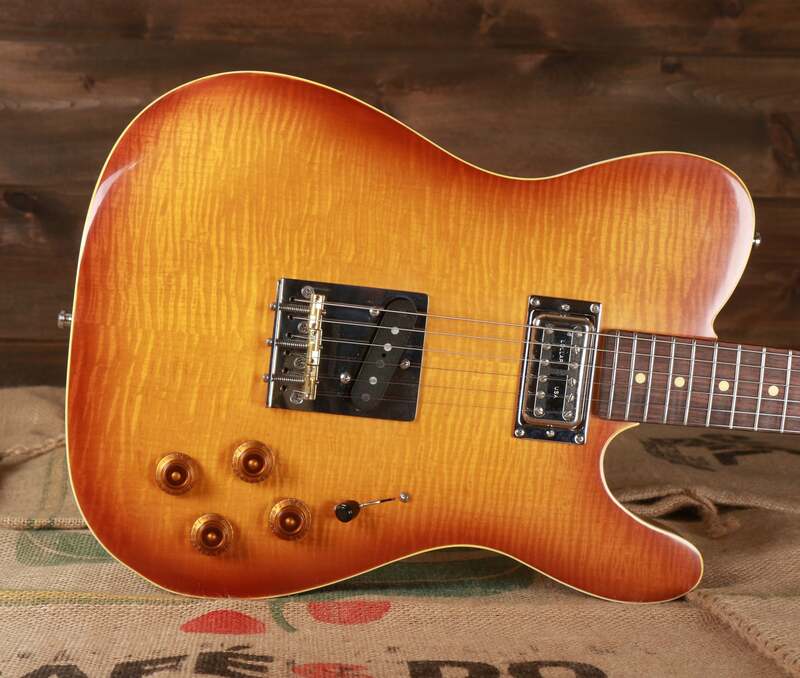 We’d love to hear comments regarding our newest production model. 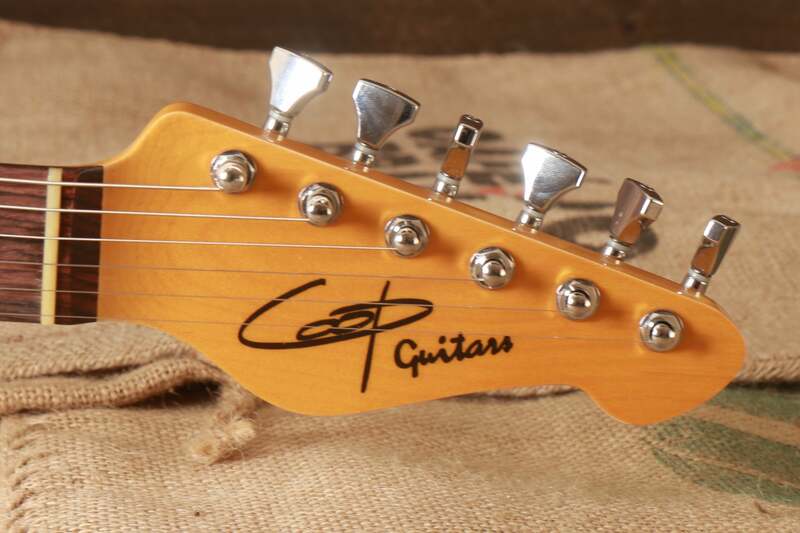 A quick view of the new Coop Headstock design. 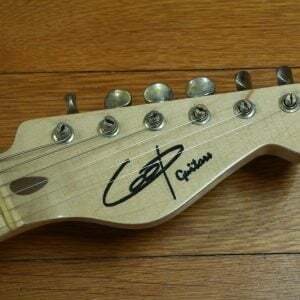 This shape will be used on all Coop bolt-on guitars and basses. Comments Off on The New Coop Prototype is officially named Coop d’etat! Far Cry From A Coop! Comments Off on Far Cry From A Coop! 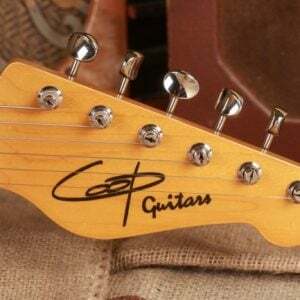 Since officially starting this business, I’ve been asked countless times why I chose the name Coop Guitars. Most people that ask about the name simply assume my last is name is Cooper, and that I’ve abbreviated my name to form the business name. 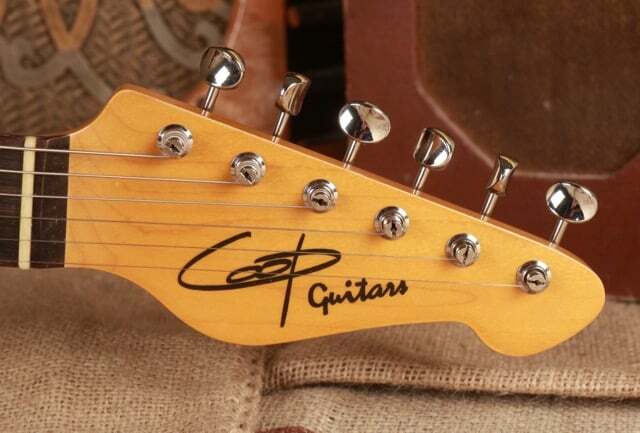 As a matter of fact, a recent wood order that was delivered to me had the name Cooper Guitars inked onto some of the boards instead of Coop Guitars. My last name is Murray, so there is no direct path to Coop from there. 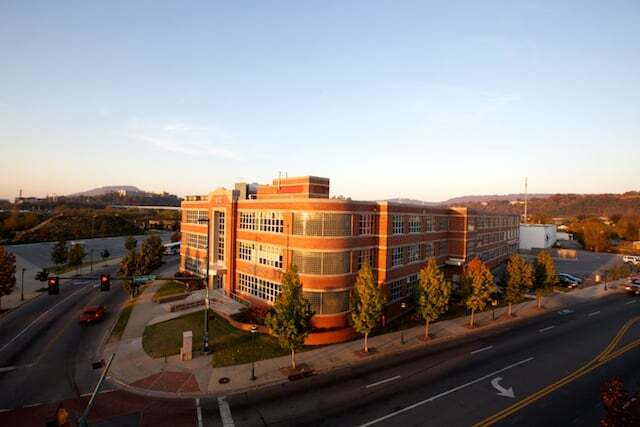 It all started before my wife (the most patient and supportive women in the world) and I moved to Chattanooga. 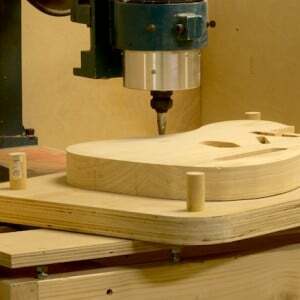 I was building guitars at a part time level in my home work shop. I realized that if I wanted to grow the business, I would require a larger/off premises shop. While visiting a friend at his new house, I was given a tour of the house and the property. On the far end of his property, there were several outbuildings which we toured one at a time. Upon entering the last building, I thought to myself “this would make a great space for a guitar building shop”. My friend was even willing to rent me the space to use as a workshop. When I asked what the building had been used for in the past, my friend mentioned that it was a chicken coop. 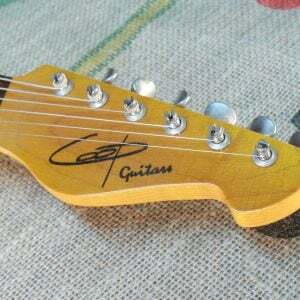 I commented that I could call the shop Coop Guitars and the idea for the name was partially hatched! Shortly before establishing the shop in my friend’s chicken coop, my wife and I decided we wanted to move to Chattanooga. The chicken coop never made it into service. With a need to secure a workshop in Chattanooga, I scoured the internet, newspapers and bulletin boards for something that would be appropriate. By complete accident, I wandered into a building across the street from my apartment and discovered an amazing program sponsored by the Chattanooga Chamber of Commerce. 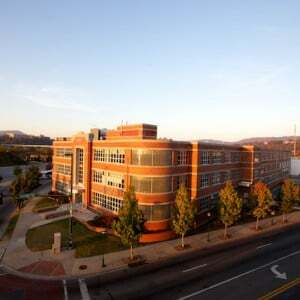 This building housed the BDC (Business Development Center). The BDC is part of a nationwide program that offers support to start up businesses by helping with things like legal services, accounting services, business plan development and in my case most importantly, affordable manufacturing space. 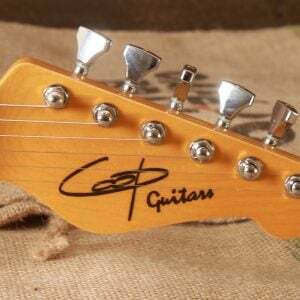 In speaking with the director of the program, it was clear that Coop Guitars and the BDC were a great fit. As she explained the program to me, she used the word “incubator” (just one more chicken reference) as in, incubator for business development. At that point, my business name was fully hatched. The shop at the BDC is such a far cry from the coop that I first thought of using that I can’t even imagine how the coop would have been functional at this point of the operation. After being so close to starting the business back in Columbus Ohio in a chicken coop, so many things came together to place me inside this wonderful program. Isn’t it funny how things work out? Maybe that’s why the chicken crossed the road! 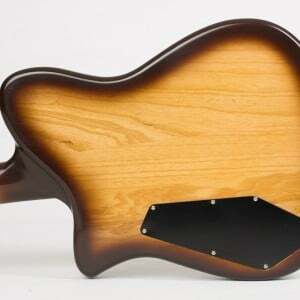 Curves, contours, bumps and pin holes! Attention to details. 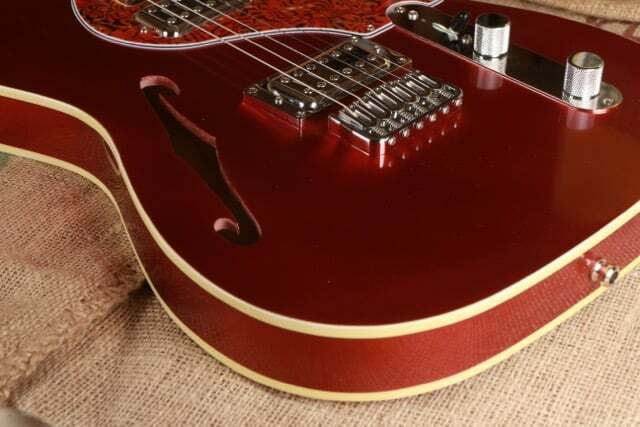 Comments Off on Curves, contours, bumps and pin holes! Attention to details. 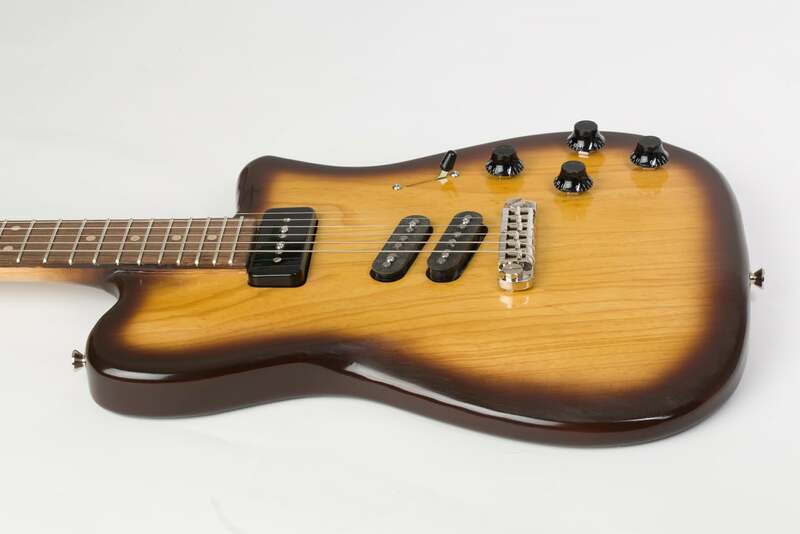 Deep “belly” and “arm” contours really make the difference between a great replica and an average one. 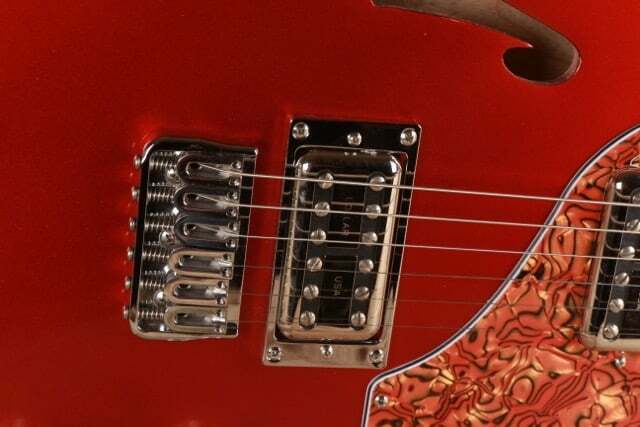 The router bump in the cutaway of my T-style bodies is a subtle feature that is over looked by other makers. 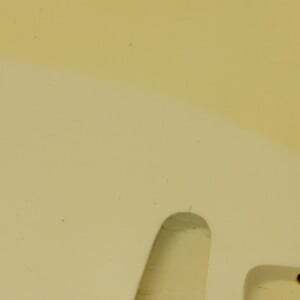 It’s no secret that paint fades and discolors over the years. 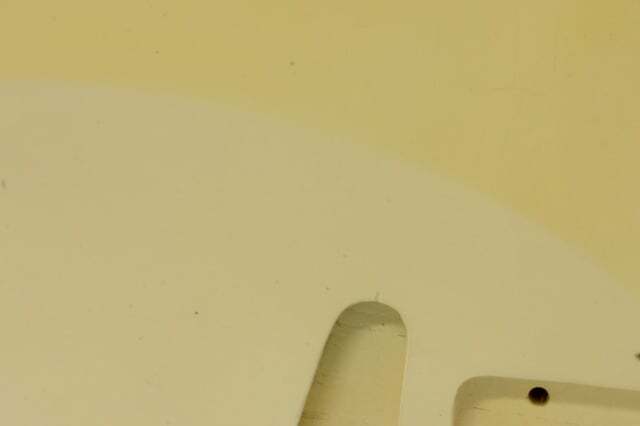 Well used vintage guitars faded and discolored more than guitars that were left in their cases. 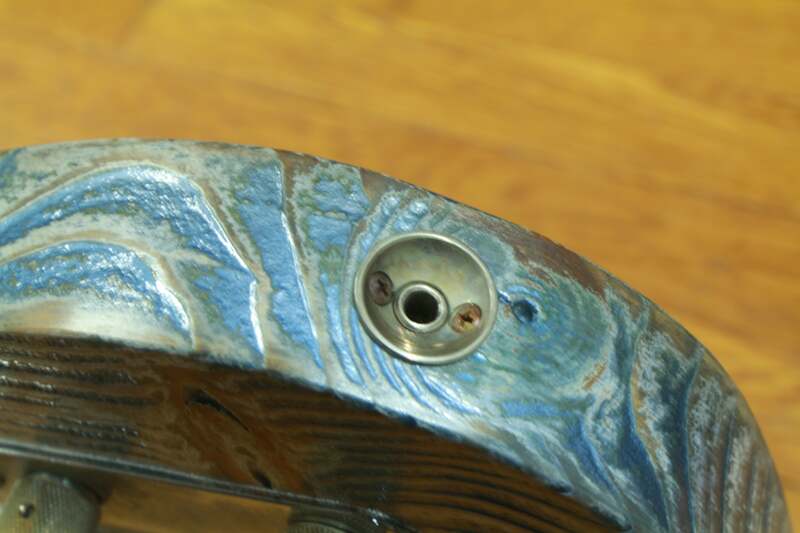 My nitro finishes simulate the fade and discoloration to varying degrees. 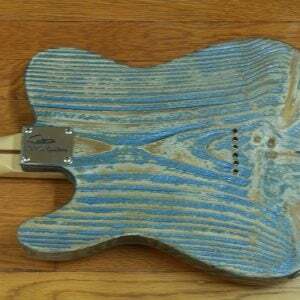 I determine how much distressing each guitar I build is going to receive before the guitar is ever painted. 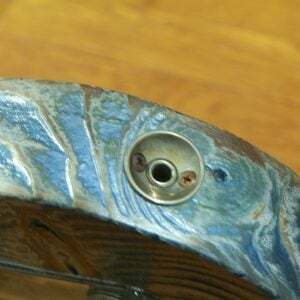 Guitars that will eventually be very distressed or aged will have considerably more discoloration incorporated into their finish. 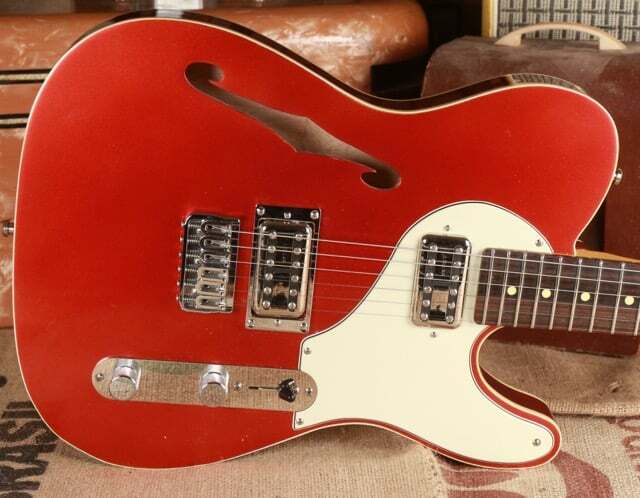 Lift the pick guard on one of my replicas and you’ll see what it looks like under a real vintage guitar. 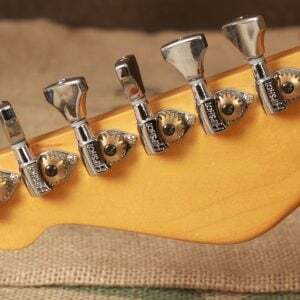 Head stock thicknesses and shapes are another one of my pet peeves! 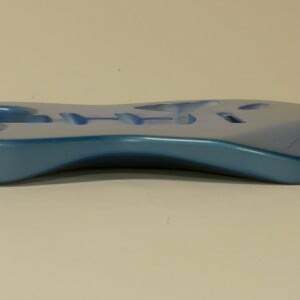 I pay extra attention to maintain the era correct shapes and thicknesses. 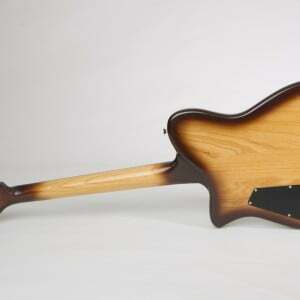 Templates cut from real, original examples of the guitars I’m replicating. 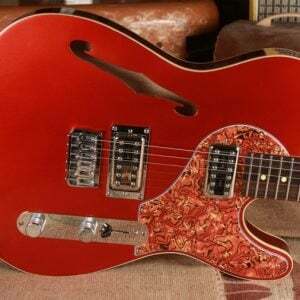 Comments Off on Templates cut from real, original examples of the guitars I’m replicating. 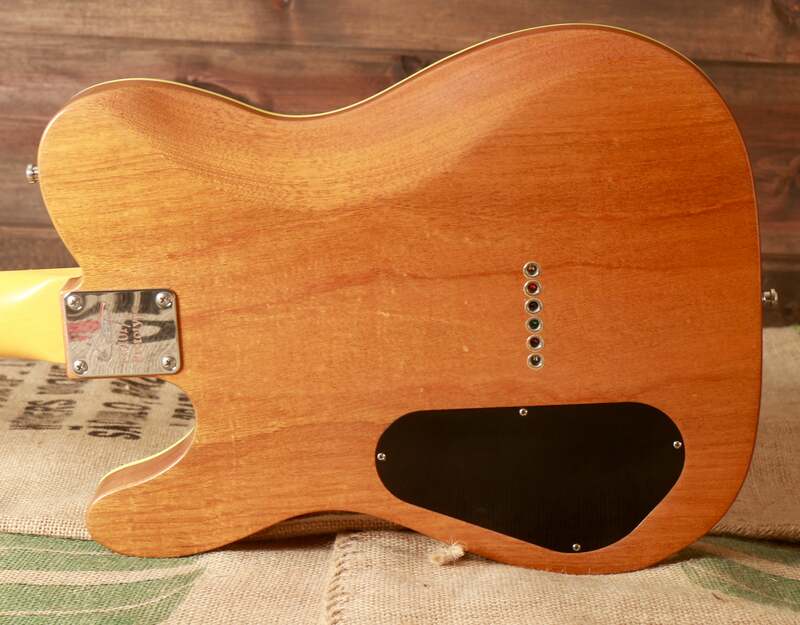 Other manufacturers of bodies and necks claim to have gotten their specs directly from vintage guitars, but I actually used vintage Fender® guitars to cut my templates. 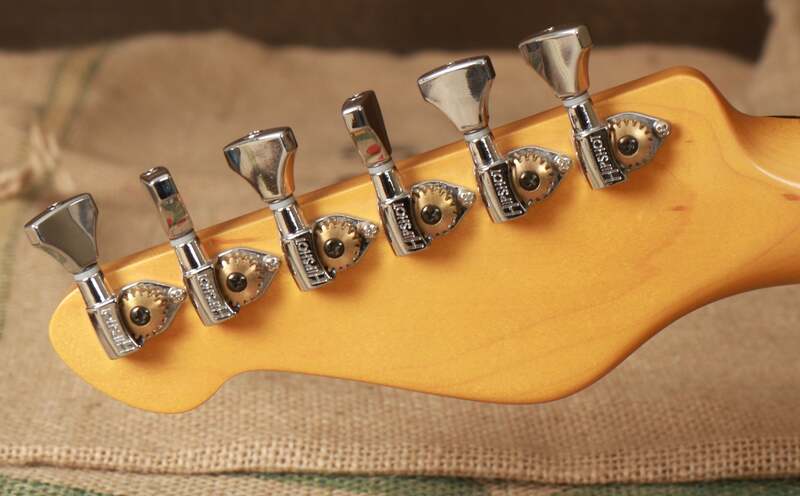 For example, my ’56 Strat® template was constructed by using an original 1956 Strat® as a template. I disassembled my ’56 and then used the body and neck as templates on my pin router to create a master set of templates. 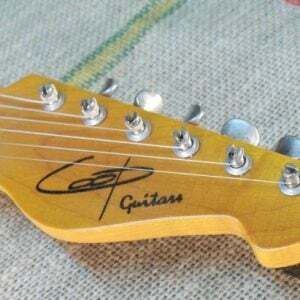 Even though I did this roughly twenty years ago when the relative prices of these old guitars was no where near what it is today, I’ve got to say that it was a nerve racking experience that could have ended up going badly. 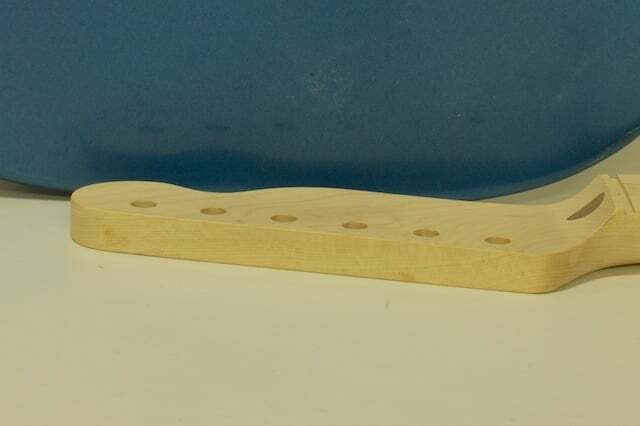 These master templates are what I use to create the exact perimeter and cavity routes for my bodies and necks. 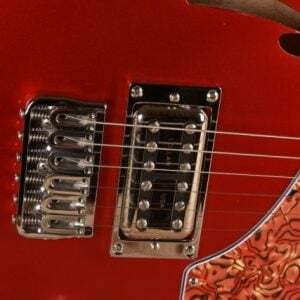 The results were well worth the risk because in this process, the tiniest details from the original guitars were picked up and transferred to the templates. 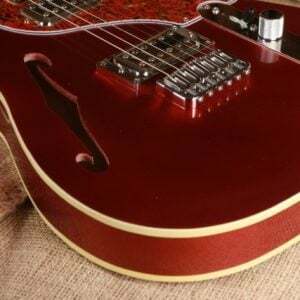 Keep in mind, that when Fender® was producing these guitars back in the day, their templates would begin to wear, resulting in slight variations from the 1st guitar to say the 500th guitar. 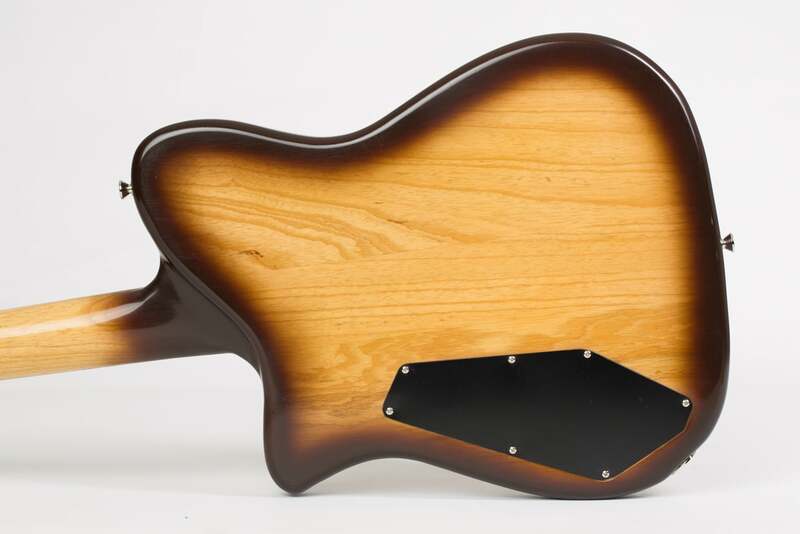 This is why a real vintage Fender® never has routes that look perfect as though a computer/ CNC machine was involved. 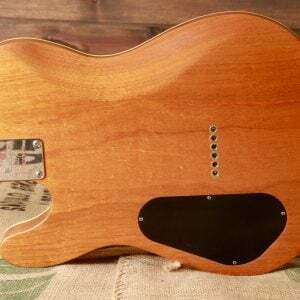 My templates reflect the wear and tear that the original Fender® templates had because my templates were constructed off of “seasoned” (for lack of a better word) bodies and necks. 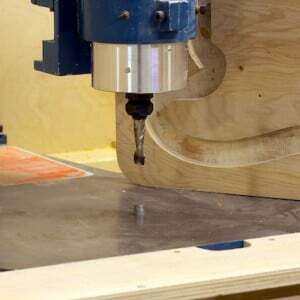 Accurate and consistent contours are created by some ingenious machines! 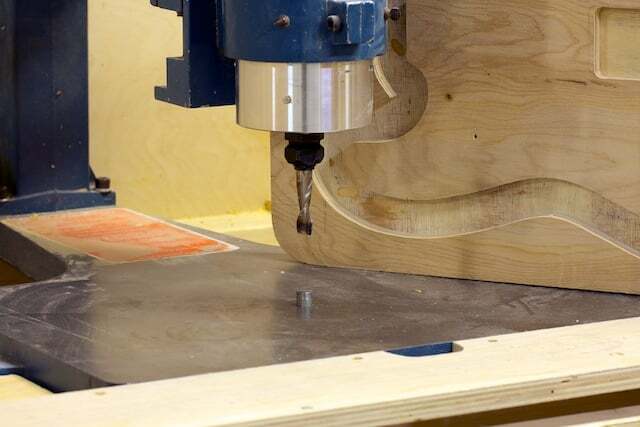 Comments Off on Accurate and consistent contours are created by some ingenious machines! 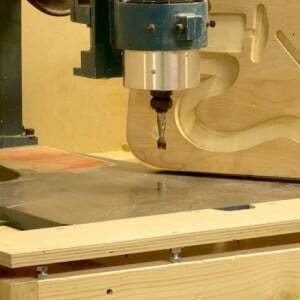 To make sure that the arm and belly contours are accurate to original spec guitars, I designed and created a three axis duplicating router that is better suited to this kind of work than any other routing duplicator on the market. 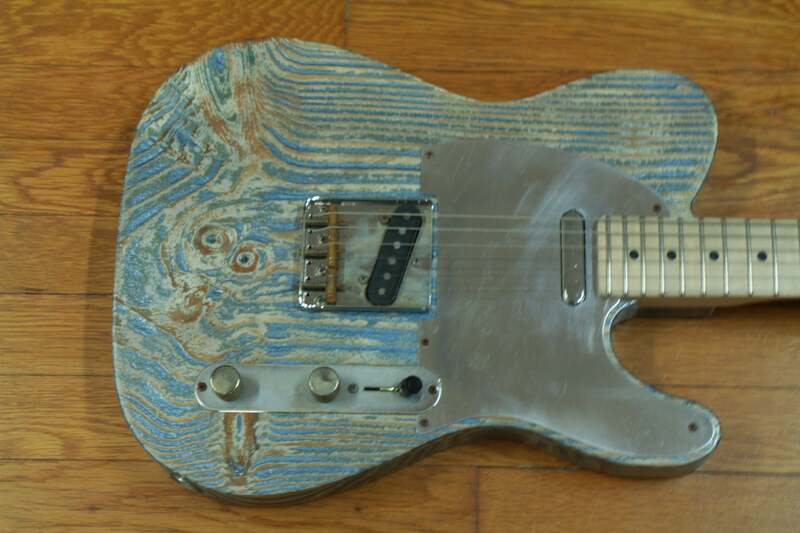 Here again, real vintage guitars were used as templates. To define my neck profiles, a similar process to body duplication was used to copy exact neck profiles. 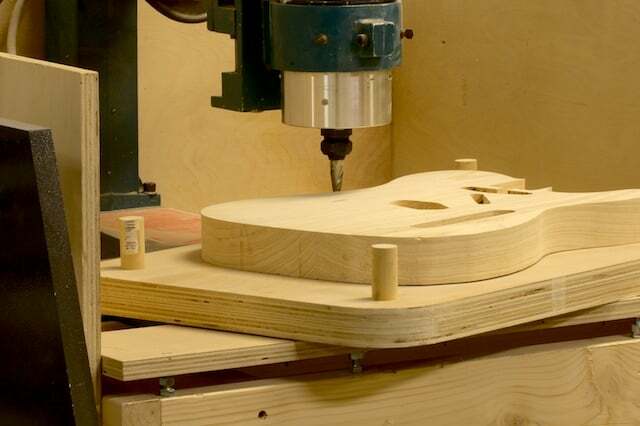 For the perfect neck profiles, I use a 4 axis router duplicator (another one of my creations), with original necks mounted as templates to copy the neck profiles of many of the most popular Fender® guitars onto a master template. 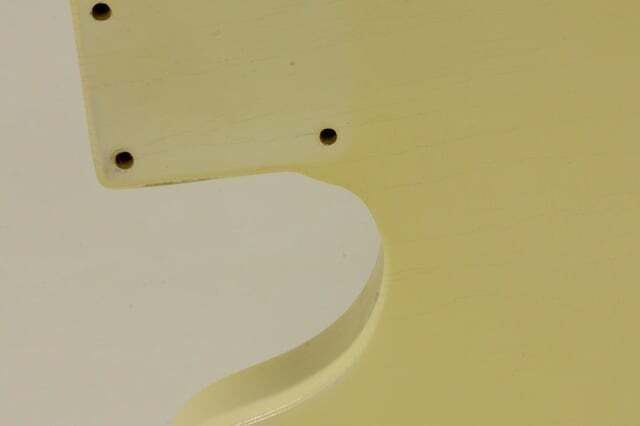 In the shot to the right, you can see the master template on the right and a ’56 style profile receiving its final contour.